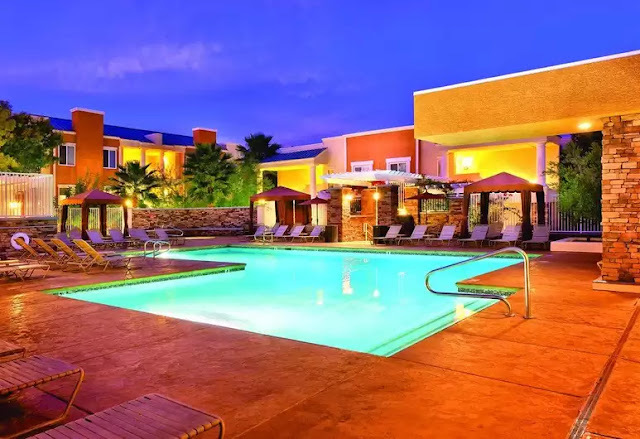 WorldMark Las Vegas Tropicana offers easy access to The Strip while set in a quiet neighborhood just two and a half miles away - in 20 buildings on close to nine acres. Situated in Las Vegas, this hotel is within 3 mi (5 km) of Orleans Arena, MGM Grand Casino, and Park Theater. T-Mobile Arena and The Park are also within 3 mi (5 km). An outdoor pool, a fitness center, and WiFi in public areas are available at this smoke-free hotel. Free self parking and a free area shuttle are also provided. Other amenities include a seasonal outdoor pool, concierge services, and laundry facilities. All 202 rooms feature kitchens with refrigerators, ovens, stovetops, and microwaves. Balconies and sofa beds are standard, as are TVs with cable channels. Weekly housekeeping is available.